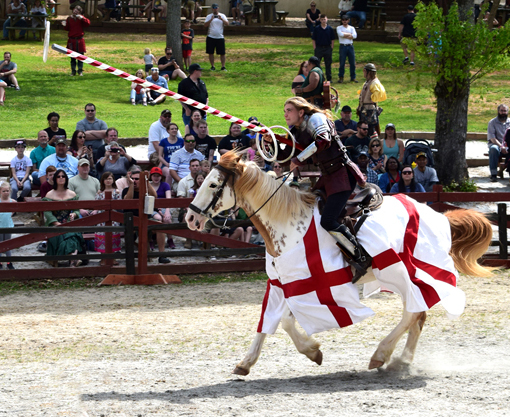 The Georgia Renaissance Festival is so much more than giant turkey legs and high-energy jousting, although both of those are totally awesome! The Festival brings a sense of community to its visitors, a sense of connecting with something so monumentally fun that you want the day to go on and on and on. This year I went with my friends Matty, Sara, and Cody—Cody and I went with other friends last year—and proceeded to laugh, watch some jousting, laugh, eat some giant turkey legs, and laugh some more, until we were totally exhausted. Great fun! 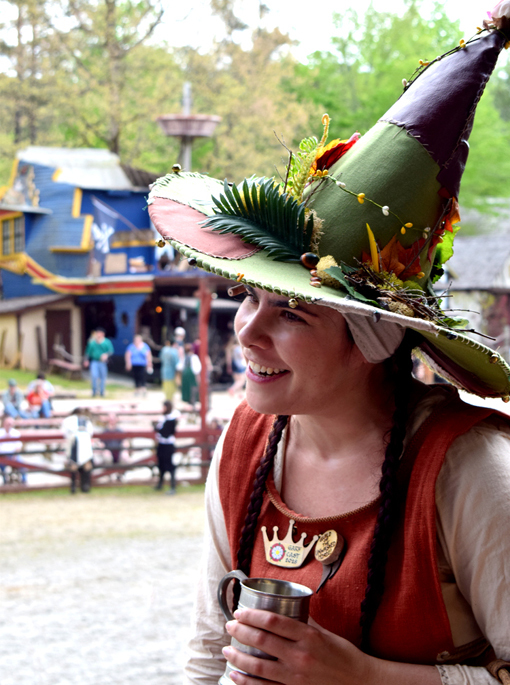 At the top of your GaRenFest entertainment list should be the Washing Well Wenches! Sprout and Gerty are my favorite people at this Festival. After seeing them last year, we couldn't not see them and we went to the first available show!. Matty and I, the brave souls that we are, sat on the front row. No matter where you're sitting, you're going to have a great view and some of the entertainment comes into the audience, too! These incredibly talented women bring you non-stop laughter! I look terrified and Sprout is just having a great time! I was, too, I just looked terrified when the camera clicked. (laughing inside) Tips aren't required, but they're certainly appreciated, and...you get strategically place your tip in one of a few different places depending on the bill's denomination. Of course we went to the jousting tournament. But this time we got the VIP tickets ("Very Important Peasant"), received a crown and sat on cushions with royalty! They were, of course, perched above we VIPs, but we were right there next to them! Be sure to pick up a schedule and map (double-sided) when you come in the main gate so that you can plan accordingly and not miss something you'd have loved to have seen. We're already making plans to go back this month...for the fun and to see some things we've yet to see and do. I didn't get her name, but this was our hostess for the jousting tournament, a very friendly lady. 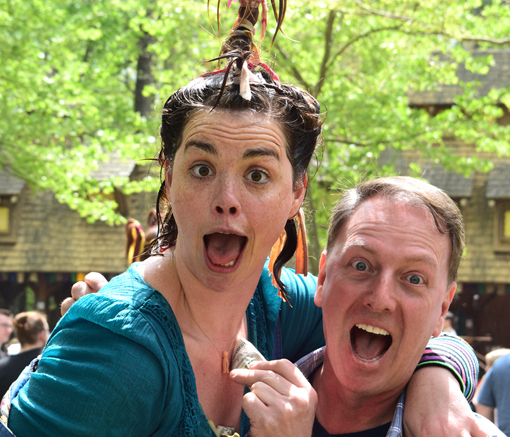 In fact, every staff member I've encountered at the GaRenFest has been gracious, delightful, hilarious and just super fun! That's a huge part of why I go back. "Thank you!" 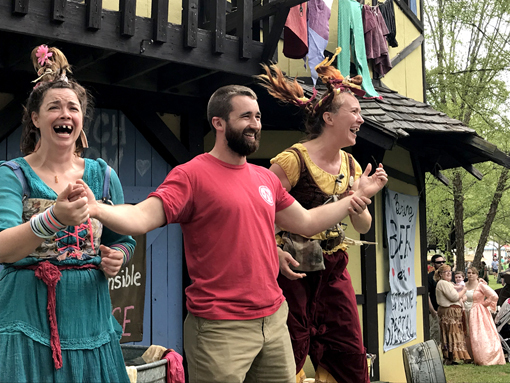 to all the GaRenFest staff for being so awesome to all of us! 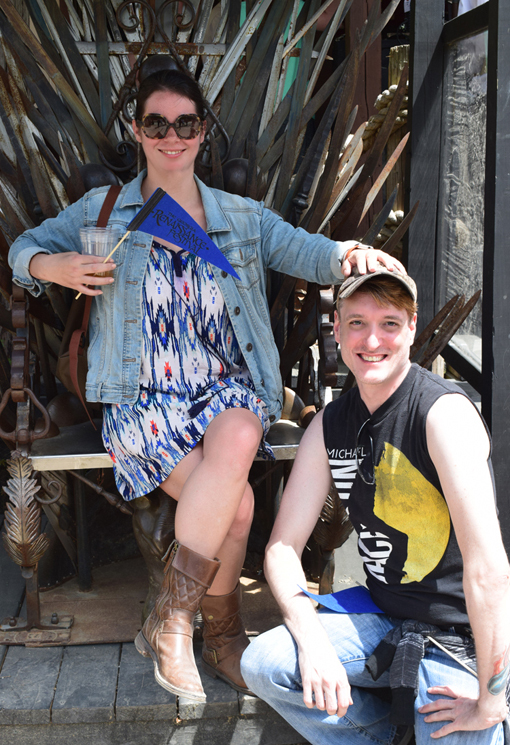 This might be the best photo-op of all...the Game of Thrones throne! That's Sara and Matty pictured above. Anyone care to venture a caption? 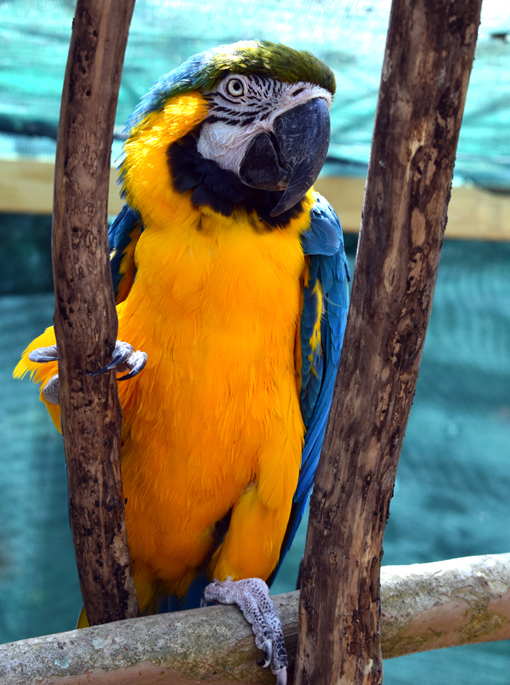 The 'Parrots of the Caribbean' is a free-flight aviary featuring exotic birds that have been rescued from being abandoned, orphaned, or unwanted. The minimum donation of $2 goes toward food, shelter, and care for these beautiful birds. I highly recommend stopping in here! This awesome experience is presented by the non-profit organization EarthQuest. Watching Barely Balanced is an adrenaline rush! Everything he's standing on is moving...it's edge-of-your-seat entertaining! And that they're hilarious is a huge bonus! 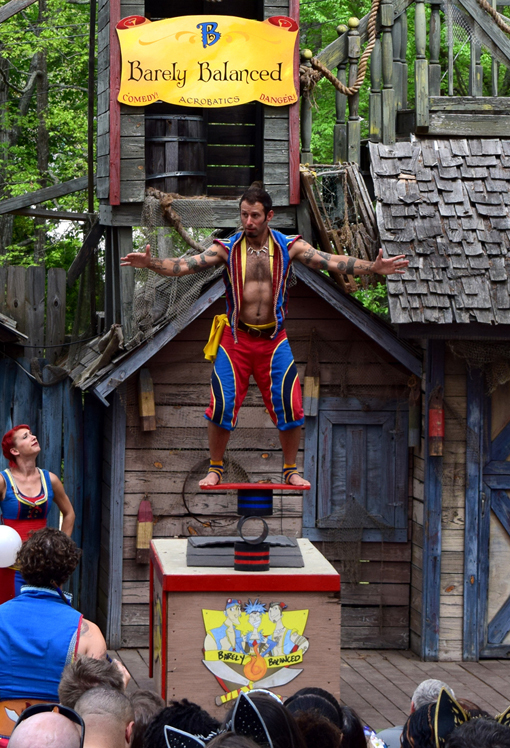 That's Cameron Tomele doing the balancing in this photo (above). You might have seen him already...he was featured on the cover of the April edition of WhereTraveler/Atlanta! 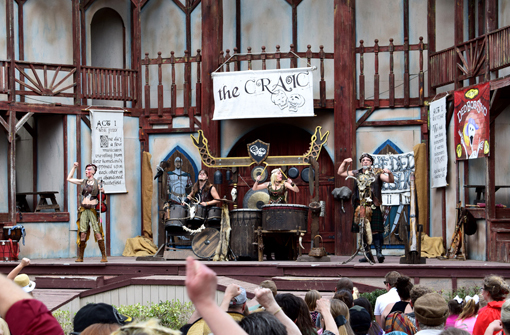 The Craic Show is another must-see, especially if you enjoy live music, of a different sort. Watch their official promo video to get a taste of what you'll hear and see! There are photo-ops galore throughout the GaRenFest, including this Mona Lisa!!! Sara is such a great sport, too! 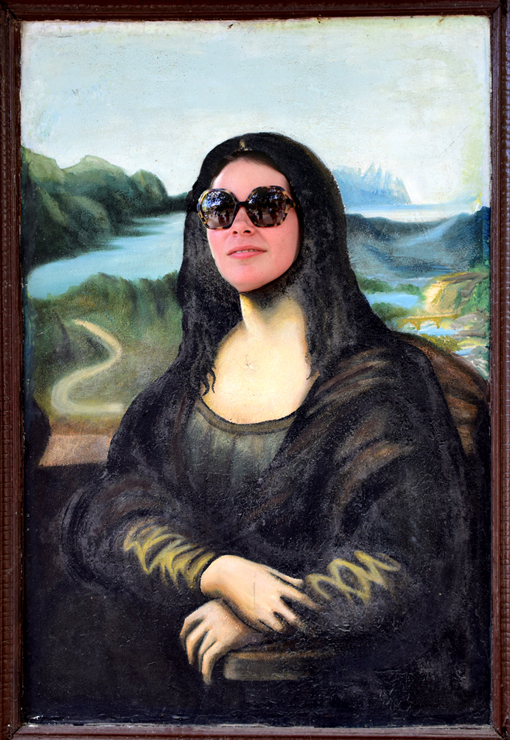 I wonder what Leonardo da Vinci would think about Sara's stylish glasses? They totally go with the outfit, right? I love The Ded Bob Sho!!! This year I got a photo with Ded Bob! You never know what's going to come out of his mouth! Er, his jaw bone, rather. Some of Ded Bob's jokes are cleverly subtle, some are over the kiddies heads, but hilarious for the older folks, even the ones that are close to Ded Bob's age. The Ded Bob Sho is an perennial treat for me! 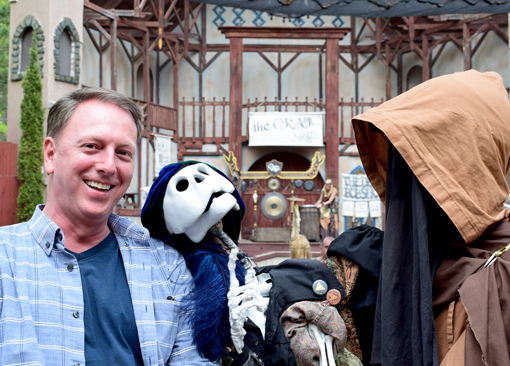 This post covers only a fraction of the fun to be had at the Georgia Renaissance Festival. I highly recommend going as soon as you can, because, like me, you very well may want to go again before the last day on Sunday, June 3. Enjoy some more photos on the wanderlust ATLANTA Facebook page.